Obviously, the big weather event right now is Hurricane Florence out in the Atlantic. However, before I focus on Florence, it should be noted that the Atlantic is on fire. 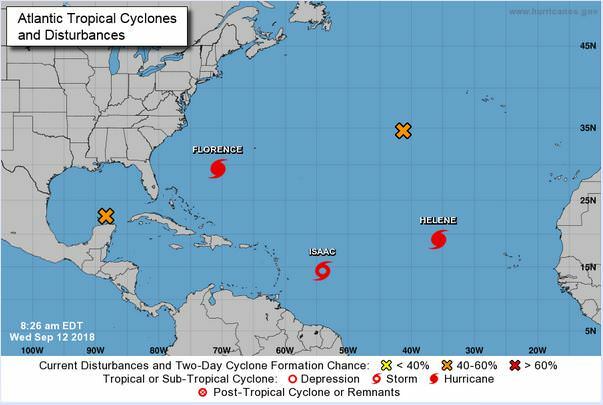 In addition to Florence, we have Hurricane Helene (Cat 1), Tropical Storm Isaac, plus two other tropical waves that stand to develop into tropical cyclones in the next 48 hours. 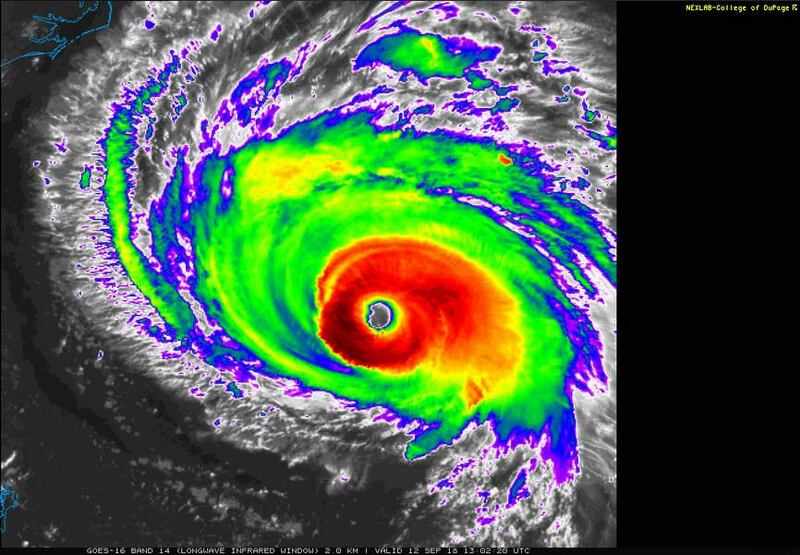 Hurricane Florence is currently a Category 4 storm, with sustained winds of 115 kts (130 mph), and a central low pressure of 943 mb. It is located at 29.4 N and 70.7 W and moving west northwest at 15 kts (17 mph). The likelihood of this storm recurving out to sea is getting smaller and smaller each passing minute. In the satellite image, you can see the well developed eye and eye-wall. Also, notice the outer spiral bands are going to make landfall in the Carolinas soon. On the infrared image, you can see that the eye wall is very strong, with high, cold cloud tops. In the eye, there are no clouds at all. I will be thinking and praying for all of the folks in the paths of these storms. This is a giant mess. 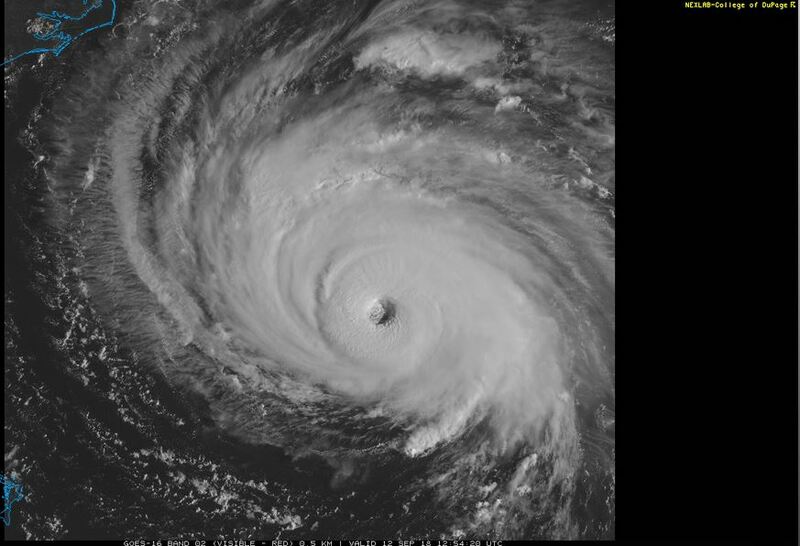 This entry was posted in Hurricane Tracking, Practicing Concepts, Predictions, Satellite Imagery and tagged #gawx, #mdwx, #ncwx, #scwx, #vawx, category 1 hurricane, Category 4 Hurricane, Delaware, DEWX, Georgia, hurricane, Hurricane Florence, Hurricane Helene, Maryland, meteorology, north carolina, South Carolina, tropical storm, tropical storm isaac, tropics, Virginia, weather. Bookmark the permalink.